Over the centuries certain areas of the sky became associated with particular stories in mythology and some of the legendary animals depicted among the stars have appeared on astronomer’s maps for thousands of years. Of these classical constellations, none extends along a greater tract of sky than Hydra, the Water Snake. Hydra stretches out over one-third of the evening sky, and as the ages have passed, many companion constellations have been tacked onto its length. A good way to find this southern constellation is to look for the group of brighter stars that mark the Snake’s head. Like some of the other very oldest star groupings, nobody seems to know exactly where this constellation came from. Some historians of the stars associate it with the Greek legend of Jason’s quest for the Golden Fleece, a treasure that was guarded by a fierce nine-headed dragon called the Hydra. A quick count though makes it clear that this is no nine-headed monster. Another myth associates it with the Nordic terror called Kraken, a huge ocean-going serpent given to swallowing ships for breakfast. A problem with these myths is that the constellation of Hydra, known to the Mesopotamians, pre-dates both of these cultures. The legend that seems to have taken hold among the stars comes from another story from Greek myth. It seems that Apollo, the Sun god, was driving his Sun-chariot high across the skies one day and that he developed an annoying thirst. Since there were no convenience stores or fast food restaurants at that altitude, he gave a jeweled cup to a passing crow and ordered the bird to bring it back filled with water. The crow accomplished the task after first defeating a tremendous snake who attempted to steal Apollo’s cup. 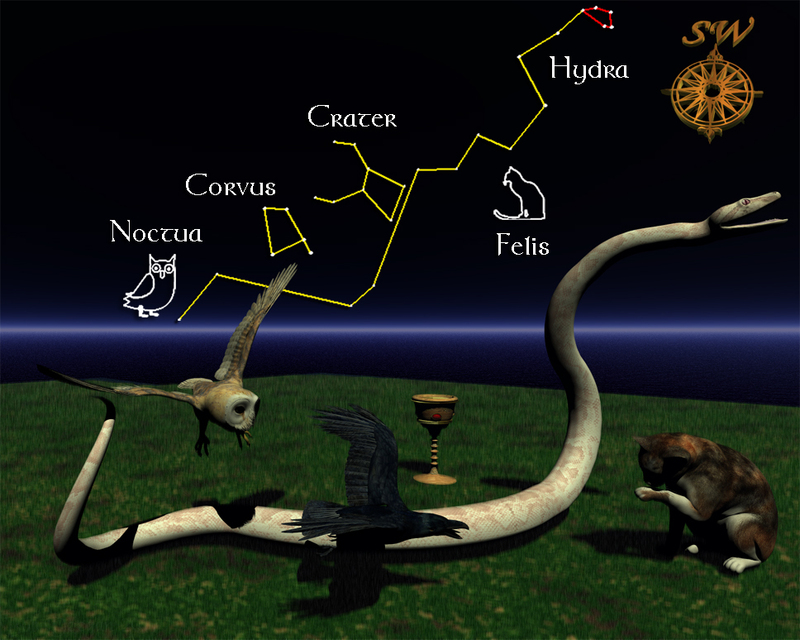 Today, we have the nearby constellations of Corvus, the Crow, and Crater, the Cup to commemorate the tale. There used to be some other constellations near Hydra, but they passed into obscurity and dropped from astronomy’s accepted list. Felis, the Cat, honored one of the household pets of astronomer Joseph La Lande. First appearing as a joke on an atlas he published in 1805, he hoped his cat would scratch the stars instead of his favorite chair. Noctua, the Owl, used to sit on the end of Hydra’s tail. The American astronomer, Elijah Burrit, created this constellation in the nineteenth century. Noctua temporarily replaced a constellation commemorating the West Indies thrush, which received the rather odd-sounding designation, Turdus Solitairius. Actually, a more familiar thrush, Turdus Migratorius, has made its annual reappearance these days, but we know it better as the American Robin. At its first meeting in 1922, the International Astronomical Union drew up the modern list of eighty-eight constellations we know today and their celestial boundaries were established in 1930. The Owl and the Cat were among the group of constellations that just didn’t make the cut. Unless otherwise indicated, all content of this web site is the copyright of Robert Deegan and all rights are reserved.